Cyber risks are once again at the top of the list on global risk reports. Todays reality is not if your company will be hacked, but when. The post Applying the OCEG GRC Capability Model to Information Security appeared first on OCEG . Cyber risks are once again at the top of the list on global risk reports. Todays reality is not if your company will be hacked, but when. In fact, many organizations have already been hacked and dont even realize it yet. Information security represents some of the largest risks and compliance activities to most organizations, and yet is often ignored because the business impact can be difficult to quantify. 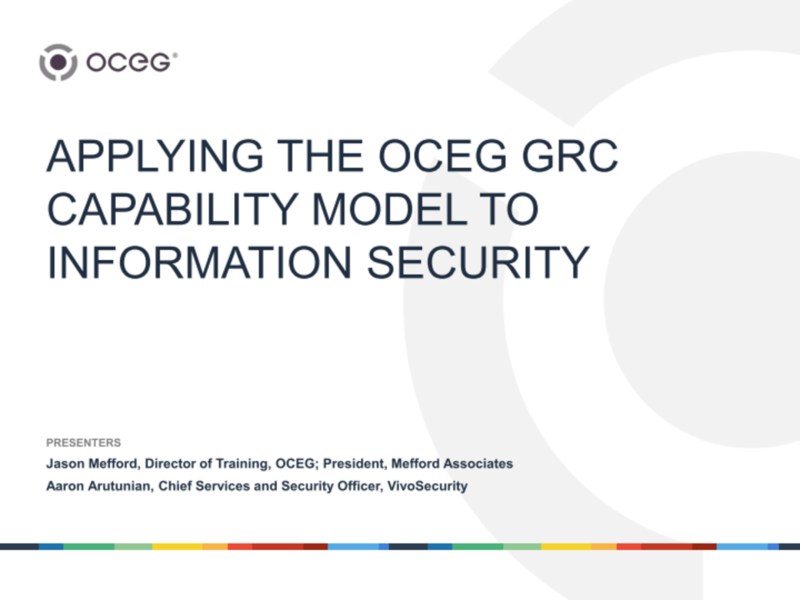 This webinar focuses on applying the OCEG GRC Capability Model to information security efforts, and showing how it works with other information security frameworks and standards. We will also discuss some ways organizations can objectively quantify business impact, so they have better information to use when making investment decisions and resource allocations to manage the risk. The post Applying the OCEG GRC Capability Model to Information Security appeared first on OCEG. We have emailed instructions to access Applying the OCEG GRC Capability Model to Information Security Slide Deck to . Make sure the email arrives in your inbox: either add "support@oceg.org" as a safe sender to your email platform, or if you use Gmail, drag our email into your Primary tab.